Esta vez con un dibujo que hace mucho quería hacer. he's like I seee you! I wonder when rumiko is going to draw inuxkag kids in the anime or the new movie? Oh, this is SO "squeeee!!!!" worthy!!!! Will you look at InuYasha!!! X3 Fatherhood can definitely make a man even sexier than ever! What's the baby's name? 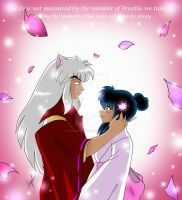 I love the look of adoration on Inuyasha's face. That is so SO pretty. Lovely work. And who is the mother? oh, this is so cute. I love the look on inuyashas face. Aww!! This is incredibly sweet. I love Inuyasha's expression. He Was Born For Her.